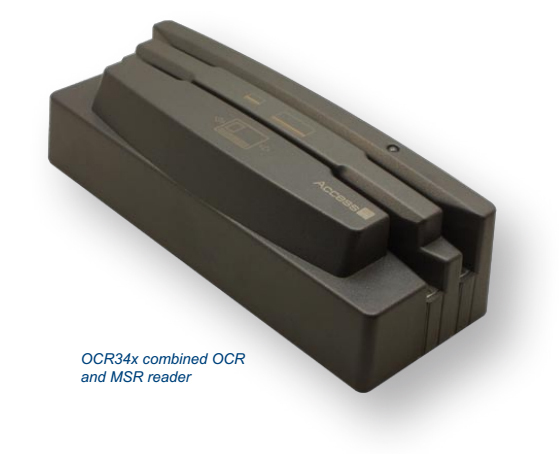 These combined OCR and MSR readers are designed for reading airline passenger travel document and cards. Most Common Use Systems are supported and the reader can be adapted to add a new host or to support non-standard cards such as loyalty or frequent flyer. 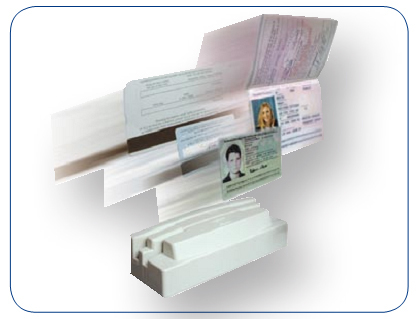 The dual illumination OCR reader captures code lines from travel documents including machine readable passports, visas and OCRB encoded cards such as the US Resident Alien Card and European national ID cards. For fraud prevention and reconciliation purposes it can capture OCR stock control numbers and ticket numbers printed on thermally printed ATB coupons and TAT documents, as well as read the IATA bar code ticket number. The four-track magnetic card reader is suitable for reading ATB2 coupons, frequent flier and credit card data. The OCR34x is extremely compact. Optional mounting brackets are available to enable the reader to be mounted at almost any angle and integrated into the smallest immigration, gate or check-in desk. Host connection is via a standard RS232 using a detachable cable. OCR34x’s are low power devices and can usually be powered from a PC keyboard or USB port. An auxiliary RS232 port allows connection of a decoded bar code scanner and to ensure future upgrades, new firmware to add and modify features can be down-loaded to the unit. OCR34x products are available in a choice of two colours. The products come as standard with RS232 interface and include an LED and audible read indicator. Further product variations are available on request: please contact our sales department to discuss your particular requirements.